Sumitomo Rubber Australia (SRAU) is the authorised distributor of Falken Tyres in Australia. 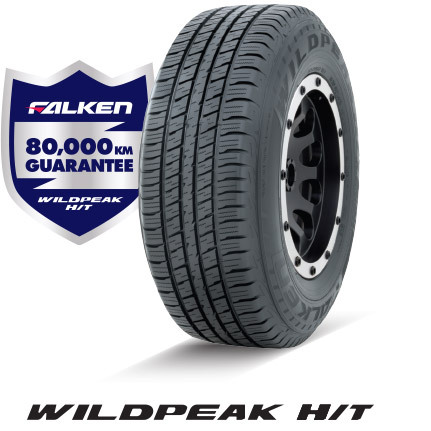 The Falken Wildpeak H/T 80,000km Guarantee (Guarantee) is only available for certain tyres from certain participating Falken Tyres dealers, and is in addition to the SRAU Warranty conditions. These Terms & Conditions are subject to change without notice. Please refer to www.falken.com.au for the latest and full Terms & Conditions. Falken brand Wildpeak H/T radial ply tyres are guaranteed to achieve 80,000km before becoming worn out at 1.6mm remaining tread depth. Pro rata adjustment credit will be given based on percentage of tread life not achieved. This tread life guarantee is applicable only for normal use & when all of the Owner Obligations are met. It does not apply to any Falken products not specified.